Oh, the dreaded wedding timeline! Your wedding day is going to be exciting, full of love, and your best friends and family. But it is also going to be a loooong day! There is so much to do, so many people to see and you want to make sure you remember to do it all while not leaving your guests wondering, "what is happening? where are they? and when is dinner?" This is why having a timeline for your day is an absolute necessity. I hear all they time that brides and grooms don't want to have a timeline because they don't want their day to be structured and just want to enjoy it. Well are you going to enjoy it when your invitation says the wedding starts at 5 and you're still having your hair done at 4:57? Or when you have barely eaten anything all day and the food still isn't ready? You don't have to have your DJ announcing, "The first dance will start in 2 minutes; this is a two minute warning for the first dance." But you do need something to guide you in keeping the festivities going. Weddings can be very stressful and a sure way to eliminate some of that stress is to create a timeline. As a bride or groom, you probably won't even worry about the timeline on the day of, but your photographer, coordinator, DJ, and caterer will all be taking care of it for you making sure the day runs smoothly. And you should consult all those vendors when creating your timeline. If you don't have a coordinator, consult with your photographer. I always let my clients know just how much time I need for certain photos and I often create a full day's timeline for them. Here is a great guide for creating your wedding day timeline! Depending on the hours you've booked with your photographer, they may photograph you getting ready and dressed in the bridal suite. The following sample timeline is based on the photographer capturing getting ready photos. This timeline also includes a First Look; you may or may not be having a first look so your timeline will be adjusted accordingly. Bridal Details: The first thing I do on a wedding day when I arrive is photograph all the bridal details. This includes rings, jewelry, shoes, dress, veil, perfume, etc. While I do this I also photograph the bride and her bridesmaids getting hair and makeup done and hanging out before they get dressed. If the groom is getting ready nearby, photographs will also be taken of the groom and groomsman either by myself or a second photographer. I normally allow 30 minutes for details and getting ready photos. A bit more if there is only one photographer to photograph both sides. Ask your hair and makeup team how long they'll need to glam up you and your bridesmaids. This will let you know what time you need to wake up and start opening the orange juice(with champagne, of course). With however many hours they suggest, count backwards from when your photographer will show up. Bridal Prep: After makeup and hair is finished, it is time for the bride to get dressed! I suggest that all bridesmaids and mother of the bride are dressed by the time the bride is ready to be dressed. This way no one is in the background of these photos in their yoga pants and sweatshirt. Try to allow at LEAST 30 minutes to get the bride dressed with all her jewelry and shoes. This is the most underestimated time. Sometimes it is not easy to get into a wedding dress and then there is the corset or a bazillion buttons. This is where most people start running late. 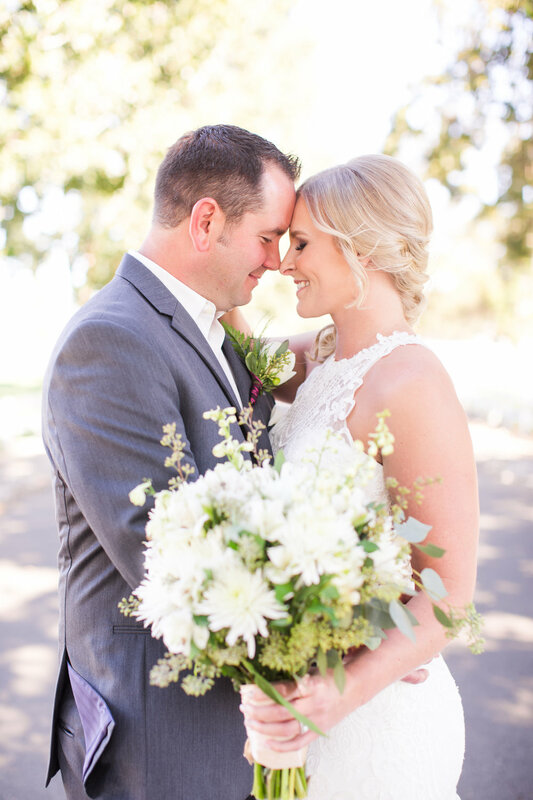 First Look: If you're planning on doing a first look, you should have about 15 minutes to enjoy each other and soak up that moment of seeing each other for the first time on your wedding day! I'll be snapping away candid photos of this moment, but I really allow the bride and groom to just be with each other here. Bride & Groom Portraits: After the first look, you'll start to have your portraits photographed. Couples who have a first look get almost twice as many photos because they have this extra time together before the ceremony. 30 minutes is an ample amount of time for portraits before the ceremony. Bridal Party Portraits: Your friends will be so anxious to get the party started after the ceremony, so a great way to make sure you have enough time to keep your bridal party focused during photos is to do them before the ceremony. Even if you aren't having a First Look, you should at least do bridesmaids and groomsmen photos separately before the ceremony. 30 minutes for bridal party portraits is enough time to capture your relationship with your closest friends. Often times, it takes less time, but planning for 30 minutes gives you a little buffer. Guests Arrive & Bride Hides: Your guests will (hopefully) begin to arrive about 20 minutes before the ceremony starts. So after portraits we will tuck away the bride so no early arriving guests see her. During this time, I'll usually photograph reception or ceremony decor. Ceremony: Most ceremonies are about 30 minutes long. Even if you plan on having a very short ceremony; plan for 30 minutes. This gives you time in case there are last minute guests or wardrobe malfunctions! It happens..
Just Married Portraits: Whether you have a first look or not, you are going to want photos of you after you're married! Depending on the time of year of your wedding, you may have only one chance after the ceremony or you could have extra time after dinner. Really, your photographer will take as much time as you'll give them for sunset photos! If the sun allows, I'll usually take some photos after the ceremony and family portraits of the couple and then steal them away during the sunset after dinner. Those magic photos you see on pinterest are during the "golden hour" just before sunset so keep that in mind when planning your day. Reception: By this time of the day, your timeline will relax and the party will get started! Consult with your caterer and your DJ when making this part of your timeline. I suggest getting all of your traditions done at the beginning. This way everyone gets a chance to see your first dance and you can just dance the night away with out thinking, "Wait, we still have to toss the bouquet!" If you are planning an exit(sparklers, confetti, etc) be sure to tell your photographer so they know they have to stay to the end! Alright, so there is your wedding timeline! But of course, since I am a photographer after all and truly believe that photographs are a very important part of your day, here is a breakdown of photo times. You can break this down however you'd like, but I'd allow this much time for each part to be photographed. EXTRA PORTRAIT TIME: I'll take as much time as you'll give me! All of my brides and grooms will get detailed instructions on how to create a great timeline and I'll help them through every step of it. They will also get a ton of info on how to make the most out of each part of the day. If you're getting married send me a message and we can discuss your vision for your wedding day!